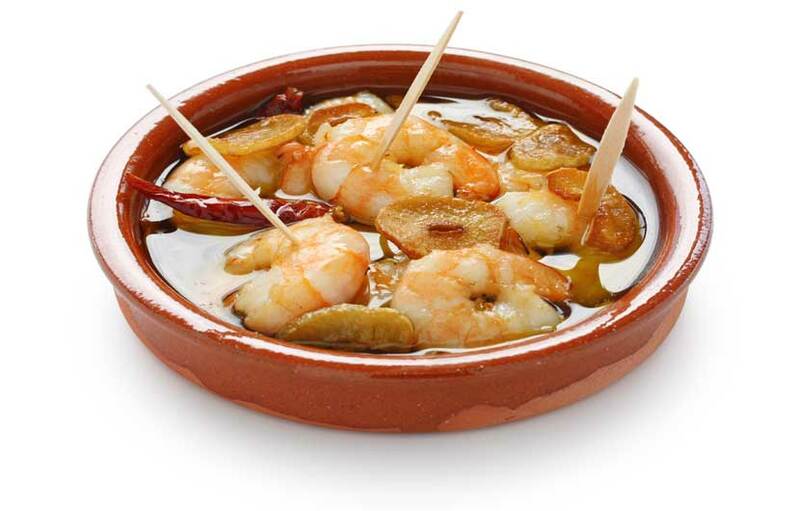 One of the great pleasures of visiting Spain is the superb diversity of local and regional dishes on enjoy. 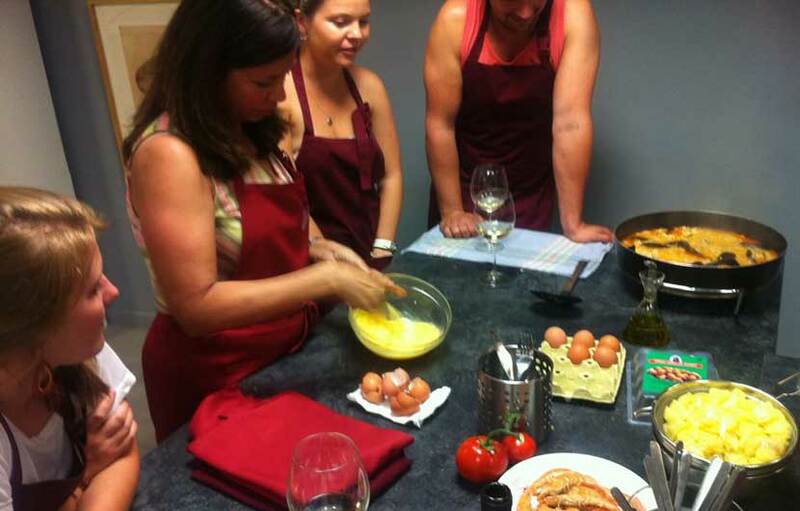 Spain is famous for using fresh quality ingredients and it is all about family, friends and enjoying life. 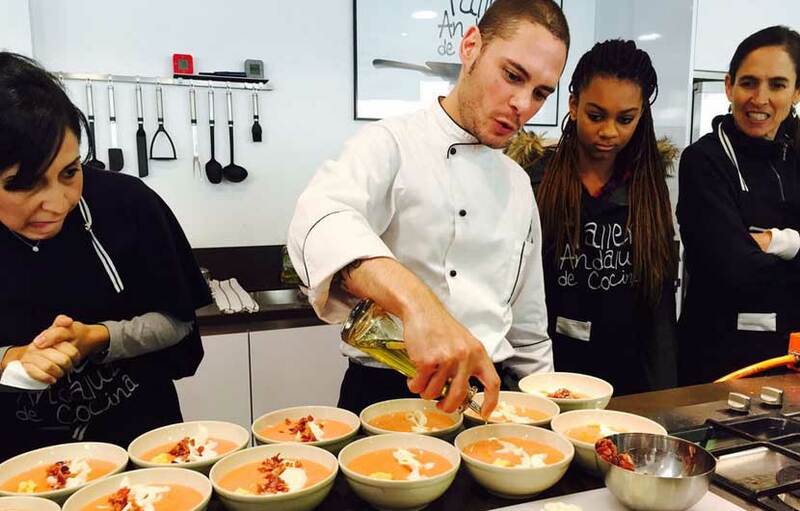 Spanish cuisine is vibrant and fun so please try out the recipes below and impress your friends cooking with that special Mediterranean flare. 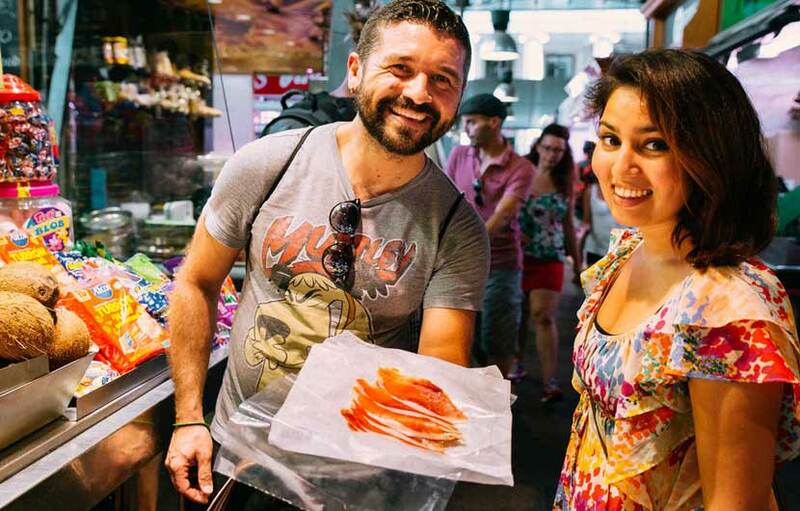 Take a culinary trip around Spain without leaving the comfort of your own home. These recipes will help you take a little bit of Spain to your very own kitchen to enjoy such typical dishes as Paella, oven baked sea bass or garlic prawns. 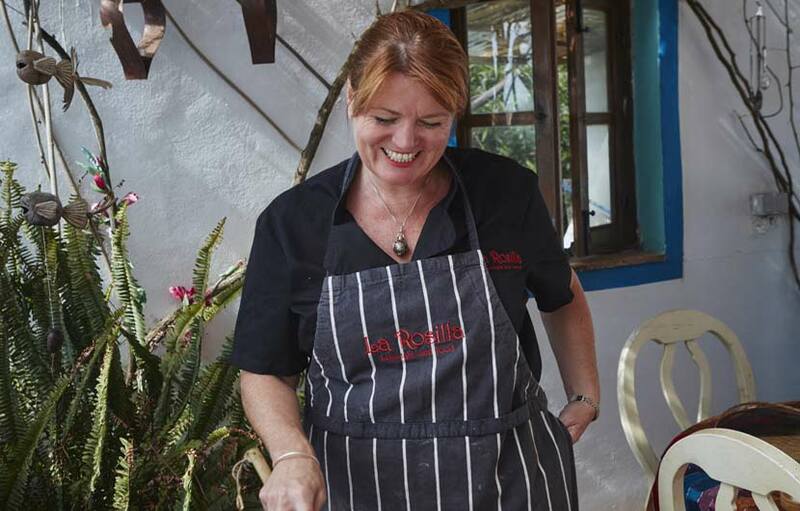 Spanish cooking has something for everyone with its diverse use of fresh ingredients, flavours and cooking methods. Here you will find a lovely selection of the most delicious recipes from Spain to try out and enjoy with your family and friends. - Soak the mushrooms with half a liter of warm water for about 30 minutes or more. - Heat up a big casserole and add a generous amount of olive oil. - Season the chicken and brown all sides. Put this aside. - Season the pork ribs and brown all sides. Put this aside. - Fry the cuttlefish. Season and put this aside. - Add more oil if needed and fry the onion and pepper until soft and caramelized. Add the shredded tomatoes and cook until caramelized and it gets the consistency of a jam. -Put back the pork, chicken and squid and the squid spleen. Stir and mix well and add the rice. Add fish stock to cover (should be at a boiling temperature) and cook for 5 minutes in high flame. Reduce the flame and cook for 10 more minutes until rice is almost done. In this time add more stock at boiling temperature if needed. - Before the rice is almost cooked, add the soaked mushrooms. - Let the rice rest covered with a kitchen towel for 3 minutes. Serve with some parsley on top and enjoy! An earthy frugal dish, which has been enjoyed and adapted by families all over rural Spain for years. The chickpea is a very important ingredient in Spanish cooking. This dish can be enjoyed as a tapa, or as a main dish. Equally enjoyable served hot or cool as an accompaniment for meat dishes. Serve in rustic bowls with a slice of lemon and a sprinkling of cinnamon and chopped parsley. Huerta, Granja y Montes - Roast Quail with braised lentils, chorizo & butternut squash with a morcilla scotch quails egg. Add the chorizo, rosemary, and garlic – saute for 5 minutes. Now that the pan is hot and has some flavor, sear the prawns, 30 seconds on each side, pressing on the heads after the first flip. Remove set aside, cook calamari rings for 30 seconds while stirring. Remove and set aside. Add the crushed tomato and cook together until the majority of the water has evaporated. Add the saffron and mix until the sauce has slightly thickened. Add the broth and slowly mix it into the rice while turning heat to max power. Once the broth boils, turn it down to medium heat and cook for 3 minutes. Turn stove to medium heat and add oil to pan. When oil is hot, cook garlic clove until golden brown. Remove and begin searing the pork until 50% cooked. Remove and let rest. Add oil and onion to pan. Chop garlic and add to onion until soft. Add the tomato pure and cook until water has slightly evaporated. Add the rice and mix well, making sure all the rice is covered in the sauce. Add broth and turn to high heat, cook until it reaches a boil. Once boiling turn the heat down to medium and cook for 4 minutes, Note: Do not stir rice after this point. Place paella into the oven for 15 minutes until the rice has absorbed all the liquid. Turn on the stove to medium heat, add the extra virgin oil and roast garlic and lemon rinds until slightly toasted. Remove garlic and lemon and set aside. Sear the chicken and pork on both sides until 50% cooked. 4. Add onions, slightly caramelize, while this is caramelizing chop the roasted garlic and add it to the pan. Add red peppers, continue to caramelize until golden Brown. Add the tomato and cook it down. Make a center in the paella, add oil and stir in the saffron. Once the sauce has cooked down, add the rice. Mix well and make sure the sauce covers all rice grains and stir for the next two minutes. Add the Broth and turn the induction to high until boiling. Once boiling turn the heat down to medium. Arrange pepper strips and meat into a decorative pattern and cook for 4 minutes. Do not stir the rice after this point. Place paella in the oven for 15 minutes until rice has absorbed the remaining liquid. Following the traditional recipe involves using plenty of bread as a thickener and also as a way to give another “chance” to stale bread. I only use 1 slice of bread or nothing at all to enhance the flavor of vegetables, but don’t forget that this is a thick cream, so squeeze the tomatoes to avoid excess of liquid if you are not using much bread. Green pepper can also be avoided if you prefer, as there are different versions of this recipe and some of them don’t use any pepper. Sherry vinegar adds a great flavor, but you can use any vinegar you may like (Modena vinegar is not a good option in this case though). Halve the tomatoes and squeeze them to remove the excess of liquid if necessary* (choose a fleshy variety like Roma, in Spain they are called “tomate pera”). Put them in a mixer along with the green pepper, garlic, wet bread, a tbsp vinegar and salt. Blend until you get a fine paste. With the motor running pour slowly the olive oil and continue blending to emulsify and get a more creamy texture. Pay attention to the mixture color, when it turns from red into orange stop adding oil. Pass it through a sieve to eliminate seeds and keep refrigerated until serving. Serve very well chilled and garnished with the chopped egg and thin strips of ham or tuna flakes. Use a large bowl to season the meat with all the ingredients, working with a fork or your hands until they are well incorporated. Let the mixture refrigerate for at least 1/2 hour. 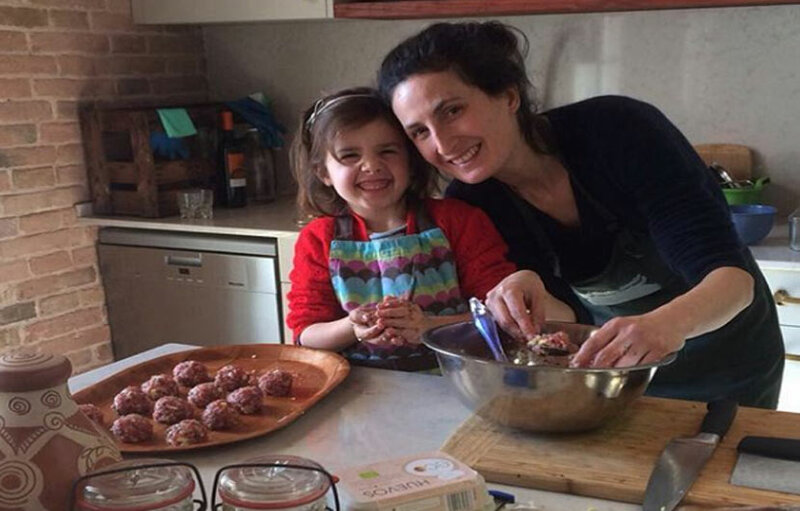 Preheat the oven at 180-200º and shape the meat into one-bite-size balls, greasing your hands with olive oil to make it easier. Place them on the oven tray covered with a baking sheet and bake them until slightly brown, about 10min. (they will cook further in the sauce). Shake the tray after 5min. to turn the balls. In the meantime prepare the sauce: fry the almonds, a small bunch of parsley, bread and whole garlic cloves until golden brown (not burnt!). Remove and transfer to a blender vase adding the water or stock, allow it to hydrate for a few minutes and blend until you get a fine mix, or leave it not too fine to add some crunchy texture. This mix, without the water, is called “majadillo”. Slice the eggplants in and cut the slices into regular sticks (the size of French fries). Toss them with salt, place in a colander and let them stand for at least ½ hour to eliminate bitterness and liquid. Place the sticks in a bowl with the flour and coat them well, shaking off any excess. For better results repeat the coating shaking off again. Heat plenty of oil in a deep pan and in batches (not too many at a time) fry the sticks, stirring gently, until golden. Place on the colander used before or a plate covered with paper towel to absorb the excess of oil. Serve immediately sprinkled with salt (if needed) and a drizzle of molasses or salmorejo. They are also great just with salt. 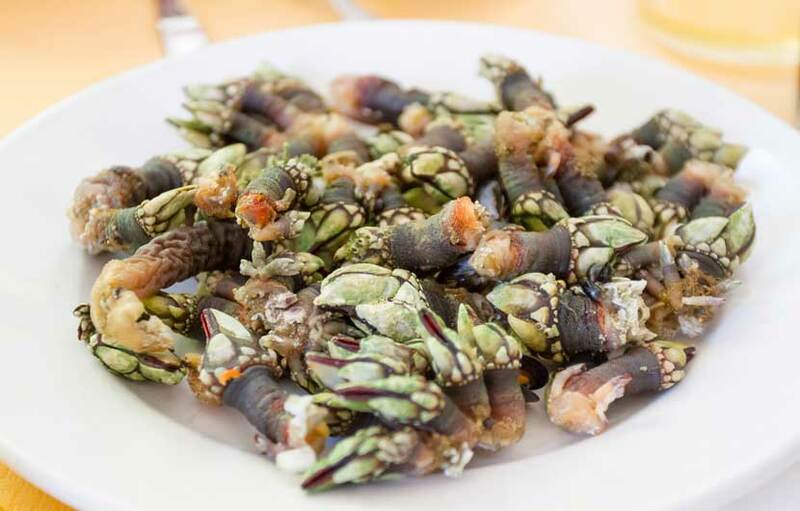 This is a popular dish from North West Spain noted for its fresh fish and seafood. Use the central part of the fish. Clean it well and cut it into thick slices. Heat the oil in a saucepan. Chop the onion into small pieces and fry; stir continuously until the onion turns golden brown. Then add two cloves of crushed garlic, a tablespoon of chopped parsley and another not very full one of paprika. Cut the potatoes into not very large slices of about 6 mm and mix well, sprinkling the tablespoon of flour over everything. When the potatoes are fried, just enough eater is added to cover them. Then the right amount of salt is added as well as six peppercorns and a clove, both ground, and bay leaf, thyme and parsley. Cook the stew for a quarter of an hour and when the potatoes are done, put them into a clay dish. The slightly salted hake slices are arranged on top of the potatoes. Put the dish into the oven for another ten or twelve minutes. Serve in the clay dish. 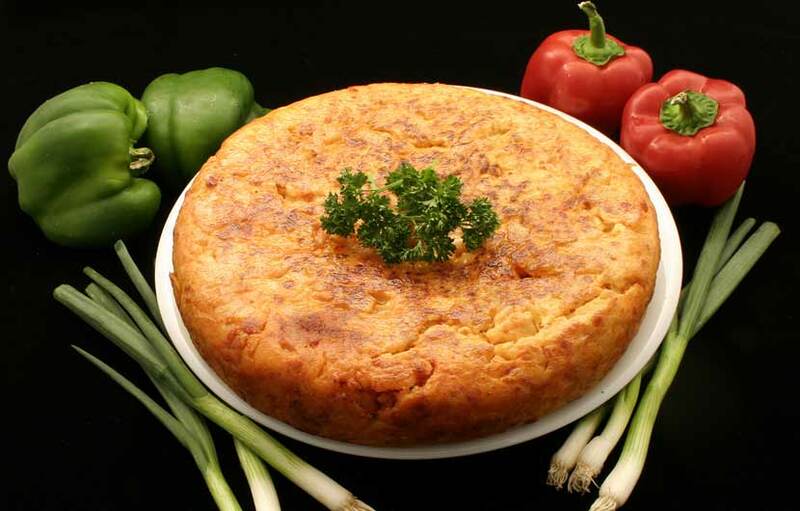 This dish is very popular in the North East of Spain although eaten through the country. A tasty chicken dish characterised by its vibrant red colour provided by fresh tomatoes and red peppers. The chicken joints are sautéed until they turn golden brown and then put aside. Prepare a fried mixture of tomato, red pepper, onion, chilli pepper and plenty of chopped garlic. Put the chicken and the fried mixture together and cook for five minutes. Then add thinly sliced semi-cured ham and cook for another five minutes. 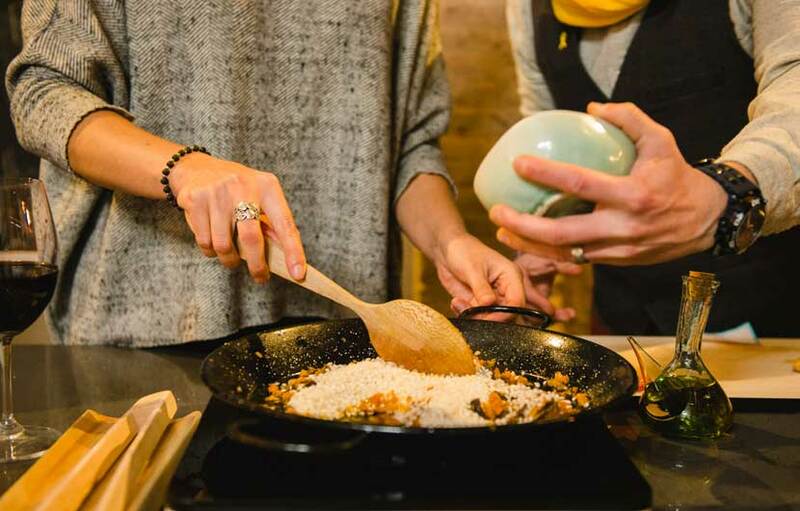 This recipe for Spanish Paella is Valencian style although it is just one of many used inn the Valencia regions and can easily be adapted to your own personal taste. 600g of dessert or other short grained rice. The best rice to use is called Bomba as it holds 3 times more liquid then regular rice. A large flat low sided pan is the most ideal for cooking the recipe for Spanish Paella. Place the pan over the heat and add the olive oil , garlic and a little salt. When it is hot add the chicken pieces frying them over a low heat until gold brown. Add the chopped tomatoes and peas and the chopped sweet pepper and bay leaves, fry a little longer then add the rice, stir and mix well so each grain of rice is coated with oil, then add a good amount of the stock so it almost fills the pain along with the yellow colourant. After boiling for 15 minutes, place the mussels and prawns evenly around the dish , then cook for about 8 minutes over fast heat and over a low heat for the rest of the time, until the rice is cooked. When cooked take off heat and leave for 5 minutes under a clean cloth to settle. 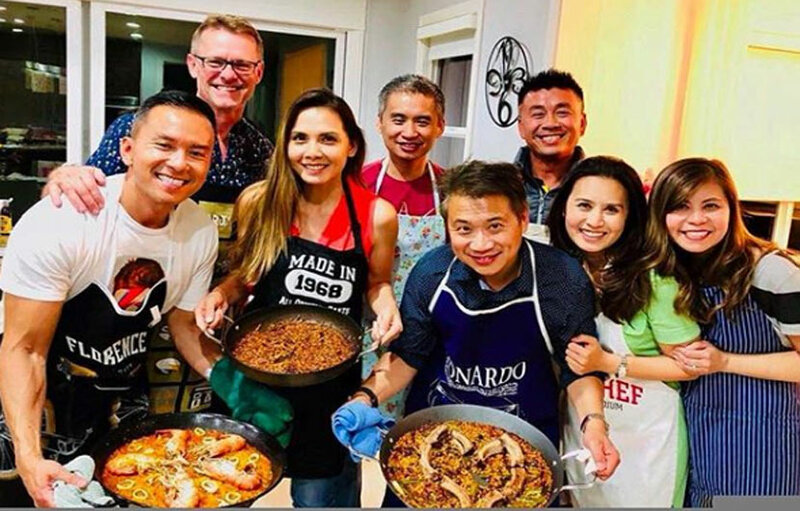 To serve, place the paella dish in the middle of the dinning table with lemon wedges placed around the dish on top of the rice. Observation: The amount of stock and the correct heat are very difficult to get right in theory. Practice will teach the correct measures for the rice to be just right. There are a wide variety of recipes for Paella in Spain. In each case it is cooked with the ingredients available at that time in the year. Many people like it with fish only or meat only or a mixture of both at the same time. 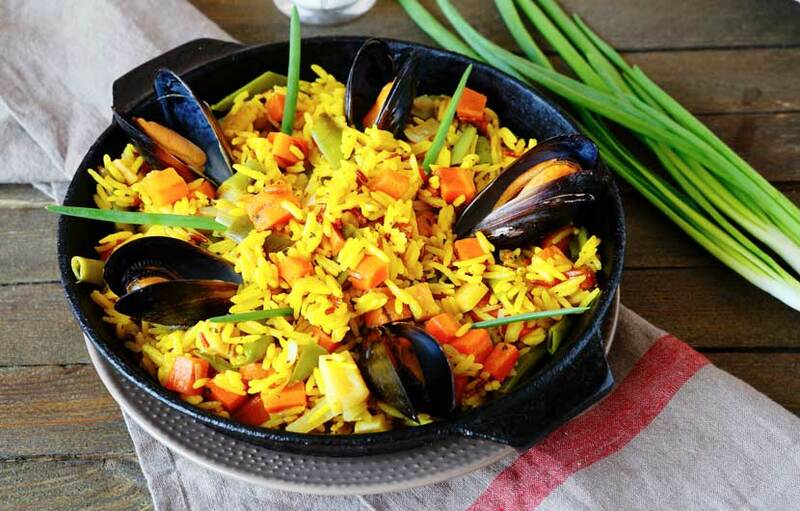 Experimenting makes a perfect Paella and you will end up with a dish that suits your taste. This recipe for fish stew Mar Menor style uses all the fresh fish available in the Murcia region located on the east coast of Spain. The different types of fish are very typical of the Mar Menor area and give the stew its characteristic flavour. 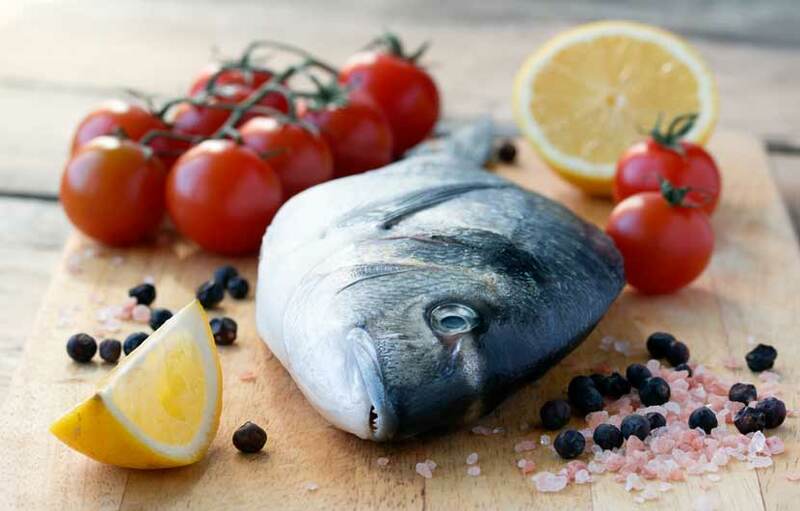 Cook the angler, red mullet, John Dory, the onion (in quarter pieces), a clove of garlic and a bay leaf together with several small potatoes in water to which salt has been added. Poach the ingredients for half an hour on a low heat. Then add the whiting, red and grey mullets and cook for another ten or fifteen minutes. Add the two fried chilli peppers and two or three cloves of garlic (all of it crushed). Remove the broth from the heat and take out the fish, the angler tail and the potatoes. Remove the bones and leave them with a little broth near the heat. Strain off the rest of the broth, crush the remaining pieces and pass them through a strainer. Use the broth to prepare rice which should be rather soupy. Serve the rice first and then the fish arranged on a separate plate with the potatoes. A rather strong ali-oli ( Mayonnaise and Garlic ) sauce is served as an accompaniment. This refreshing dish has its origins in Andalucia in southern Spain, although influenced by the Greeks, Romans, Moors and Arabic cultures. It is mostly know now as a tasty cold soup eaten mostly in the summer months.. The original recipe was stale bread, olive oil and garlic all mashed up with some vinegar or water in a mortar. Other vegetables that where available at the time where also added, such as tomatoes and almonds. 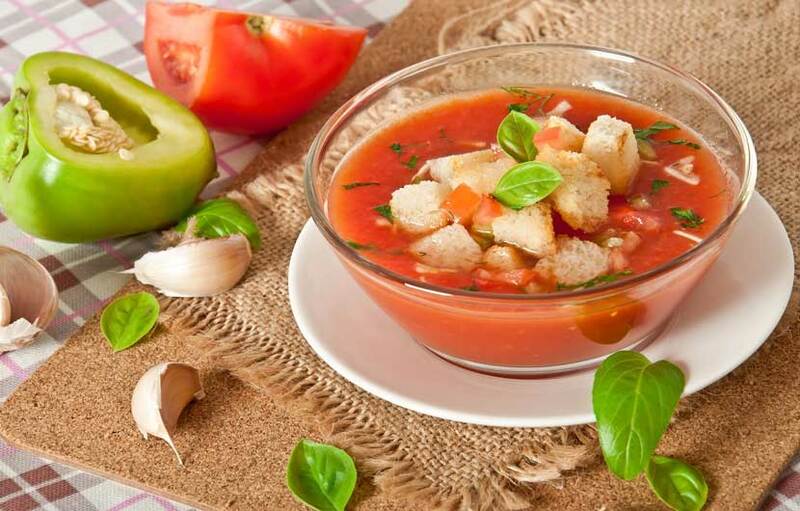 The following recipe for Gazpacho soup is a traditional one but can be adapted to suit your taste. 1 half of a cucumber. This is one of Spain’s most famous dishes and apart from the basic ingredients, it can be prepared in many different ways to suit all tastes. 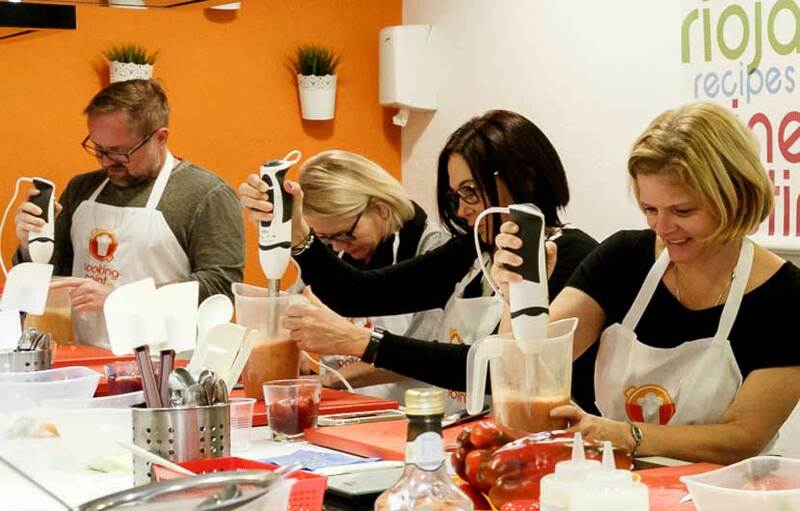 This is one of our most popular and easy ways to prepare Gazpacho Andaluz. Add the chopped peeled tomatoes moistened crusty bread and blend until you have all the ingredients are blended to a fine consistency. This can be served with our without a garnish of finely chopped onions, tomatoes, cucumber and croutons. Each one should be placed in a seperate small dish so each person can add as required. Calamar frito is one of the emblematic fish dishes in Spain and so easy to prepare. The secret is making sure your squid is super fresh and not overcook. Clean, rinse and dry the squid well. Put the flour into a wide-bottomed bowl and toss the squid rings in it, until lightly coated. Then dip the pieces into beaten egg. For deep frying use a good quality oil, preferably extra virgin olive oil for an extra special taste. Make sure the oil is very hot, drop in the squid, a few rings at a time for 1 to 2 minutes, until golden brown. Drain the rings well, place on a serving dish, sprinkle with some salt, and garnish with the lemon wedges. This dish is well accompanied by garlic mayo and lemon juice. Callos is eaten all over the Iberian peninsular although its origins are though to be from the Madrid area hence the most famous recipe is known as “Callos a la Madrilena” Callos Madrid Style. 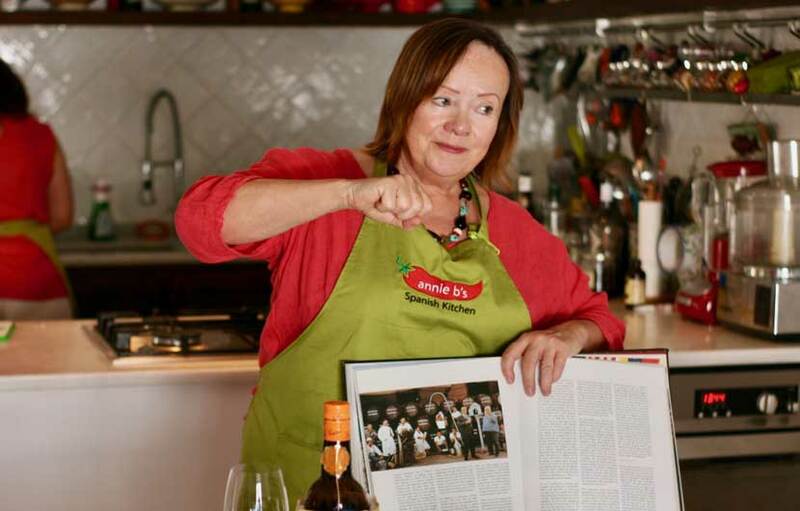 Really though its true origins are not know, recipes though for Callos have been found in books dating back to 1599. Callos has been known as a typical Madrid dish since the 19th Century. Soak the tripe for about 5-10 minutes, rinse thoroughly and drain well. Cut it into 5 cm squares. In a large, heavy based pot, heat the oil and saute the onions and garlic until lightly golden. Stir in the pimenton ( paprika ), tripe, chorizo, and pour over the wine. Bring to the boil and stir in the tomatoes, thyme, chili, bay leaves, cloves, peppercorns, nutmeg and a pinch of salt. Now add the morcillas ( black pudding) and cook over a very low heat until the tripe is tender, which could be between 1 and 2 hours, but taste after one hour. Once the tripe is ready, discard the bay leaves, stir in the garbanzos (chickpeas) and heat through for about 5-10 minutes. Before serving, sprinkle over the chopped parsley. Sea bass is readily available all over Spain and this recipe is a simple way to prepare and cook what is known in Spain as Dorada al Horno. There are many types of sea bass but Dorada is probably one of the most popular and economical of the bass varieties used in Spanish cooking. 1 cleaned large sea bass around 1 kg. Preheat oven to medium high, around 200C. Spread the onion over the bottom of a shallow oven proof dish and lay the fish on top. Drizzle over some oil and lemon juice. Add the strained tomatoes, wine and sprinkle over the bread crumbs which have been mixed with the parsley and garlic. Drizzle over a little more oil and place in the oven. Cook for 25-30 minutes, basting occasionally with the juices from the fish. When the fish is cooked, transfer to a hot serving dish and cover with the sauce. To garnish, surround with lettuce and some slices of lemon. White fish soup is a quick to prepare rustic dish so there’s no need to spend to much time on chopping the ingredients into small even pieces, with this dish rough is good. Peel and roughly slice the potatoes, onions, green pepper and garlic. Cut the hake into around 4 to 5 large pieces. Place the water into a medium sized saucepan and simply add the Potato, pepper, tomato, garlic, salt and pepper and a small amount of virgin oil to the water, bring to the boil then slowly simmer for about 20 minutes to half and hour in the covered saucepan. Add the hake pieces and slowly simmer for a further 2 minutes then remove from the heat and leave to stand for 3 minutes. Pour in a generous amount of olive oil and the juice of the lemon. Patatas viejas is a very popular dish in the Canary Islands. Wash the potatoes well but do not remove the skin. 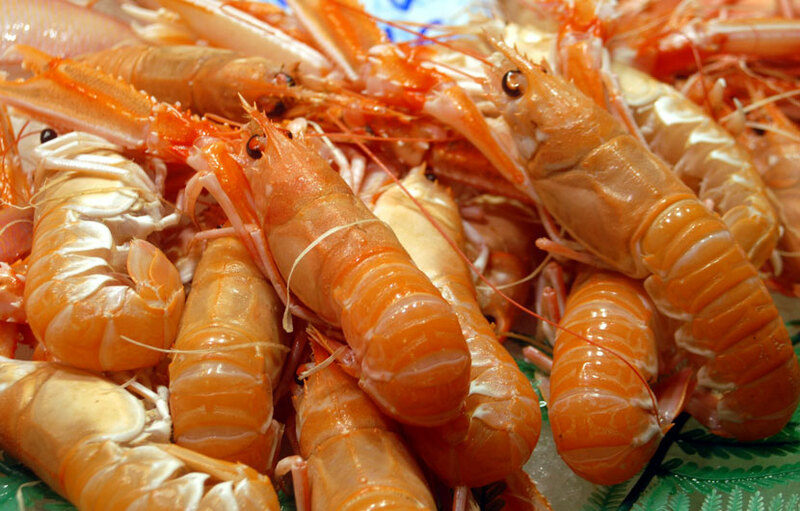 Put them in a pan and add enough water to cover them, together with half a kilo of sea salt. Cook until the skin is wrinkled (ie, arrugada). Drain the potatoes and place them on a plate. A salad dressing is added individually to suit. Usually a little sweet chilli pepper is added as well. Te wrinkled potatoes can an be eaten with fish and meat dishes alike. The most authentic sauce though to accompany the potatoes is called ” Mojo Picon ” it is quite pungent and has an unusual and tangy taste, here is the recipe. Soak the dried red bell peppers in a bowl or pan of warm water for around 15 minutes which will soften and rehydrate them. Drain water and remove the stems. Chop or break the stale dry bread into small pieces. Place the peppers, garlic slices, cumin and pimenton and salt in a food blender to create a course paste. Then drizzle in olive oil gradually. Add the small pieces of the dry bread and enough water or chicken stock keeping a n ice thick consistency to the sauce. Add a small amount of the vinegar to your taste. This sauce goes perfectly with the patatas Arrugadas as well as fish and meat dishes. Bring fish broth to boil. Add shrimp and cook, covered, for 2 minutes or until cooked through. Strain, reserving the broth. Keep broth warm. Shell half amount of cooked shrimp and finely chop then set aside. In large saucepan, heat olive oil. Cook garlic, onion, tomatoes, parsley, paprika and saffron. Simmer about 2 minutes. Stir in rice and mix well to coat with oil. Brown rice in olive oil for 3 minutes. Pour in boiling hot fish broth and chopped shrimp. Bring to boil and cook over medium high heat, uncovered, 5 minutes. Lower heat and simmer, covered, until rice is tender, about 15-20 minutes. Sprinkle wine over rice and cook over high flame for a few seconds. Mound on warm serving platter and pass with allioli sauce. ( Garlic and mayonnaise ). 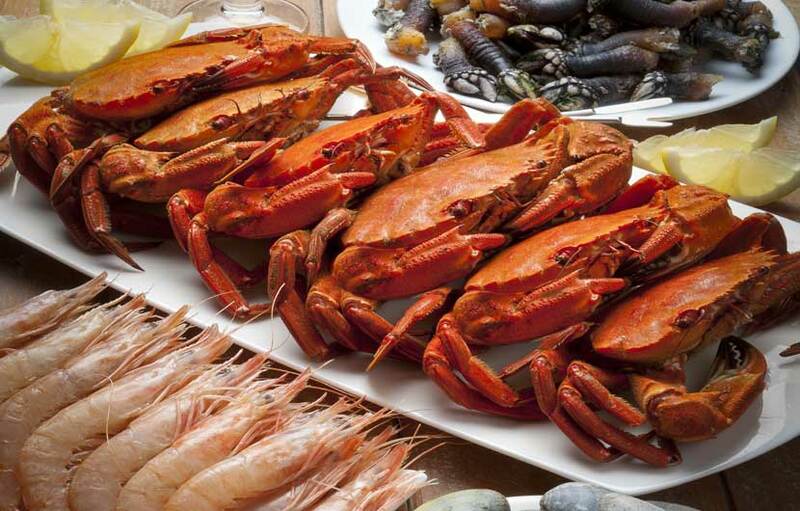 Serve fish and shellfish on separate platter, garnished with lemon wedges. Heat 2 tablespoons butter in large saucepan and sauté onions until soft. Stir in saffron, rice and a pinch of salt. Add hot broth. Bring to boil. Lower heat and cook, covered, for about 20 minutes. Just before serving, stir in tomato paste and 3 tablespoons butter. Quickly put rice in a mold, pressing down lightly with a spoon. Remove from the mold onto serving dish and garnish with parsley leaves. In small bowl or mortar, mash the garlic, parsley, saffron and salt. Set aside. Heat olive oil in paella pan with a 15-inch (40 cm) base. You can also use any large flat round pan. Add chopped ham and chorizo. Fry, stirring for a few minutes, remove and place on a warm platter. Add chicken pieces, sprinkled with salt, and fry over high heat until golden on all sides. Remove to warm platter. Add squid, halibut and swordfish. Sprinkle with a dash of salt and fry. Remove to warm platter. Add shrimp and sauté about 3 minutes, or until barely pink. Remove to warm platter. Add chopped onion, tomato and peppers. Sauté until soft. Return the cooked ham, chorizo, chicken, fish and shrimp to the paella pan. Add the parsley-garlic mixture. 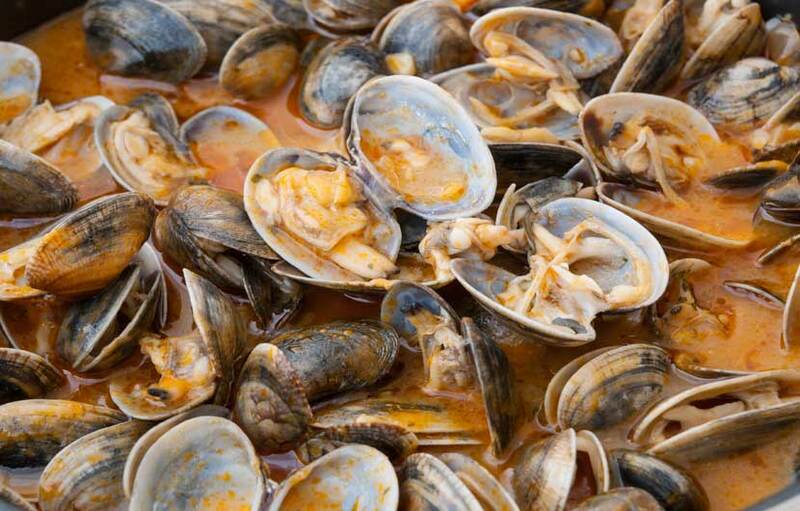 Add cooked clams and mussels. discard any that have not opened. Stir in rice, and juice of 1 lemon. Fry for 2 or 3 minutes. Pour over the hot chicken and fish broth, while stirring. Bring to a fast boil. 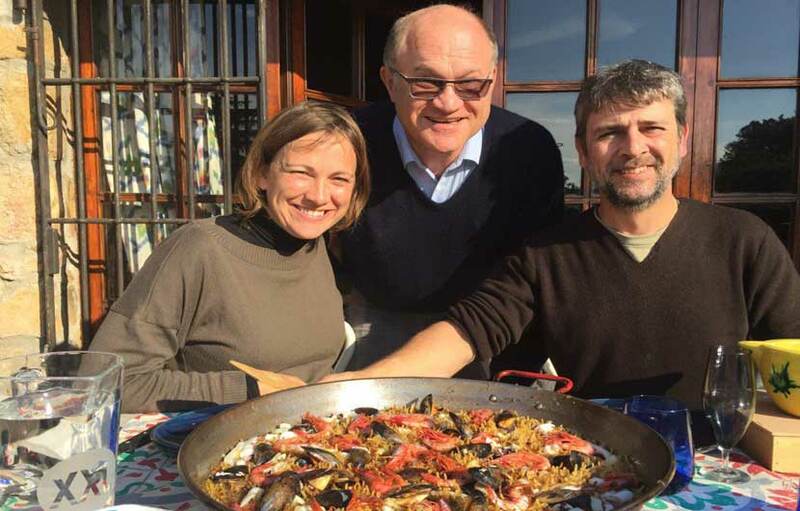 Decorate with large crayfish around the edge of paella pan. Simmer for 20 minutes, without stirring. Turn off heat and shake pan lightly to prevent rice from sticking. Cover with dry towel for 10 minutes. This allows rice to absorb any excess broth. Heat oil in large pan. Add chicken pieces and cook over moderate heat until golden brown. Then place the chicken pieces in large, shallow casserole and season. Pour off all but 4 tablespoons of oil in pan. Saute the garlic. Stir in water and bring to boil and pour over chicken. Add lemon juice and saffron. Cook, covered, over low heat about 15 minutes or until meat is tender. Serve, spooning sauce over chicken. We suggest a light, dry red wine, for example a Torres Coronas from Catalonia or Señorío de Sarria from Navarra. Marmitako is the traditional Basque Quiso Marinero – a tasty fish stew, prepared in an earthenware casserole.Fresh tuna is one of the favourites of Basque cuisine. It is caught at the end of the summer, while chasing anchovy. Heat oil in large earthenware casserole and saute onion and garlic over low heat until onion is tender. Add fresh tuna, tomatoes, pimientos, cayenne, parsley and bay leaves. Season with salt. Turn carefully. Pour over the wine and fish broth. Add the amount of water needed to cover. Simmer, covered, for 1 hour. After 40 minutes, add potato chunks. Season to taste. Serve in casserole with fresh crusty white bread. Cover bottom of large casserole with oil and heat. Brown the meat pieces for about 15 minutes. Add onion, garlic, carrots, green pepper, bay leaves, salt, red wine and water. Heat to boiling; then reduce heat. Skim off foam. Cover and simmer for 3 hours. Remove meat to a warm platter. Discard bay leaves. Skim fat from broth. Purée broth in blender until smooth. Pour into saucepan. Stir in chocolate powder and heat through. Pour over oxtail pieces and serve immediately. If you wish to make additional sauce, add more red wine or beef broth. This dish goes best with a good quality red wine. Place pepper and onion rings in salad bowl. In small bowl combine olive oil, vinegar, garlic, parsley, salt and pepper. Pour over onions and peppers and let sit for a couple of hours. Stir once in a while. Arrange lettuce pieces on bottom of large serving plate. Pour pepper-onion mixture over. Garnish with anchovies and sprinkle with chopped egg. Heat oil in skillet over medium heat and add garlic. When garlic begins to brown, add mushrooms all at once. Stir and cook until almost done. Add red pepper and dry sherry. You will find this dish in most good tapas bars and restaurants around Andalucia and some other parts of Spain. 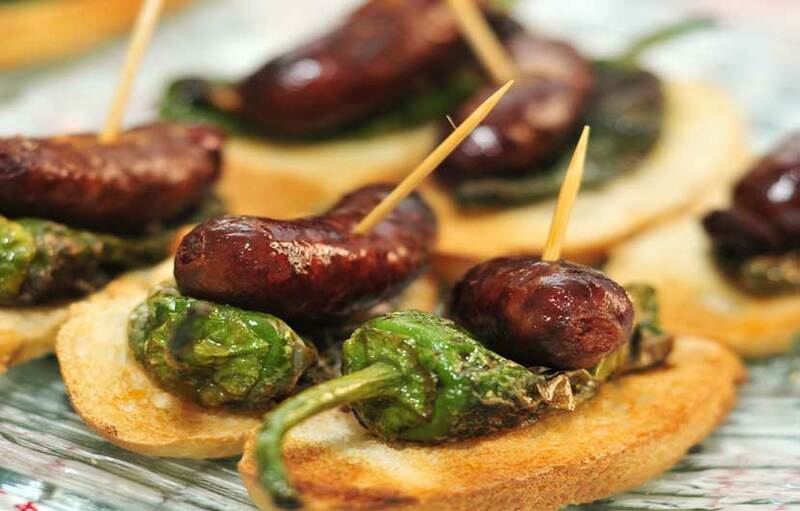 Although a relatively easy dish to prepare it evokes great passions within these sunny shores and still remains one of the most popular tapas or starter dishes in Spain today. 1/4 pint of Extra virgin olive oil. 1/2 teaspoon of dried hot paprika or red chilli powder. 1 roughly chopped red chilli. 15 to 24 large, raw prawns, peeled. It is very important to use good quality extra virgin olive oil. Place the prawns in a large earthenware casserole, add the roughly chopped cloves, diced chilli, and chilli powder and sea salt. Cover with the extra virgin olive oil and place on high heat, stir only a couple of time whilst cooking. Remove casserole from flame and immediately cover with plate. Serve in same dish while still sizzling and uncover at table. Serve with crusty white bread for dunking. In a deep casserole sauté slowly the shredded onion in some olive oil; when the onion starts changing colour, add 2 peeled chopped garlic cloves and a sprig of parsley both chopped, add the tomatoes, pealed and chunked; poach for five minutes in enough water to cover ingredients. Incorporate the fish and add fresh water to cover it all. Crush in a mortar ( or blender ) the SAFFRON, 2 cloves of garlic, the almonds, the slices of bread pre fried in olive oil and a sprig of parsley. Incorporate the crushed mix into the broth, season and cover, leave it to boil slowly for 20 minutes. Steam the mussels and extract the meat from shell draining all their juice through a thin mesh strainer. Add this mussel juice into the broth a few minutes before serving and stir. Strain the fish and break it apart into small chunks and strain the broth through a china cap. 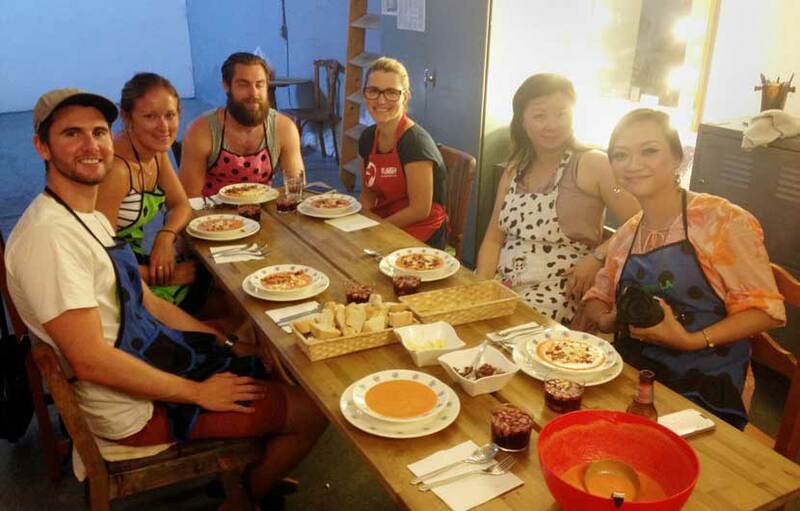 Portion the fish, shrimp and mussels in to 4 individual cooking bowls and fill each with their respective broth. Shred all carrot and cabbage, either fine or coarsely depending on preference. Dice the celery and scallions quite fine or in longish strips ( Julienne style ) . Place all the vegetables in a large mixing bowl and add the rest of the ingredients. Now slowly mix all the ingredients together until all the sauces and mayonnaise are mixed well and all the shredded vegetables are coated evenly throughout. This should serve 8 to 10 people. Peel the garlic cloves and roughly chop. golden colour put in the peeled prawns and seasoning, cover the dish with a lid and cook until the prawns are firm and cooked, remove from heat and serve hot. Wash and peel the potatoes then roughly cut into irregular smallish chunks. Heat up the oil and cook the potatoes over a medium heat, when the potatoes are almost cooked through and not to brown in colour remove them from the oil and place on a plate, draining off any excess oil. Pour away into a dish most of the olive oil leaving a small amount in the pan, then place the potatoes back into the pan and pour over the slightly beaten seasoned eggs and continue cooking over a moderate heat. With a spatula lift up the omelette and turn over when the bottom is golden brown. Cook for another 10 minutes until both sides are a light golden brown colour then tip out on a dining pate and serve hot or cold. Place the Olive oil, sea salt and lemon juice in a bowl and whisk until the ingredients are well blended together. 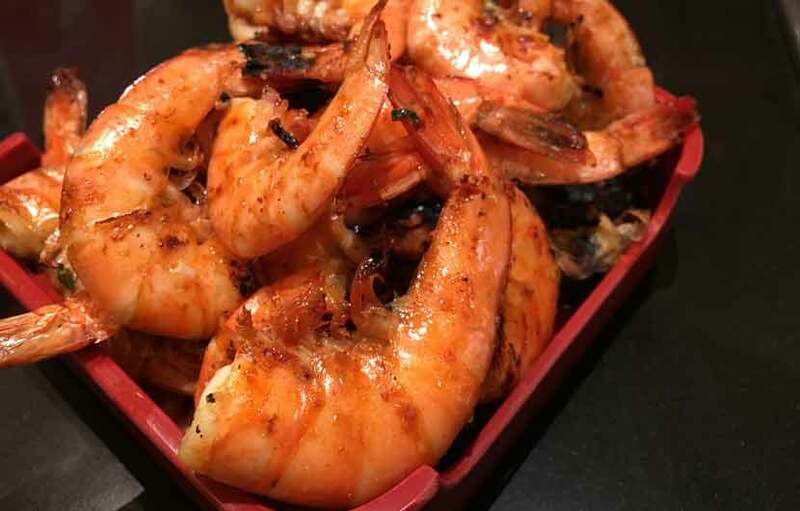 Dip the shrimp ( in batches of say 6 at a time ) into the oil mixture and make sure ithey are totally coated, then sear them on the skillet for about a minute then turn over, then cook another minute on each side until they are golden brown, then remove and leave to stand on a hot plate. Repeat until all the shrimps are cooked. I table spoon of White wine vinegar. Wash very well the mussels under clean water making sure that all the debris and beard of the shells has been removed. Place the mussels in a deep pan and pour over a cup of water , cover and bring to the boil and cook until all the shells have opened. Finely chop of the onion and green pepper, put into a small bowl and add the oil, vinegar and season, mix well. Take the mussels and remove one side of the shell only and leaving the other half with the mussel in and arrange on a plate, pour over the vinaigrette sauce and serve cold. Remove the stalks, wash and clean the mushrooms, making sure there is no grit left on the inside. Dry in a cloth and cover in the lemon juice to keep the freshness. Heat up a heavy pan or skillet and add the oil ,place on the mushrooms, topside up first, cook for about 5 minutes then turn over. Fill up the mushrooms with the chopped parsley and ham, pour over the sherry, cover with a big lid and leave to cook for another 5 minutes and until the mushrooms are a nice golden brown colour. If you’re a foodie, you’ll be delighted to find that it’s customary to have more than just three meals per day in Spain. And you’re certainly not limited in dishes to choose from! 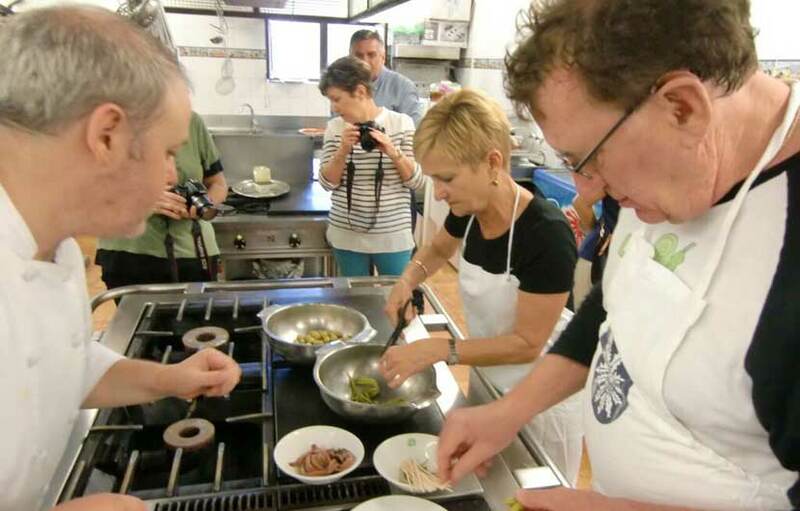 There are also plenty of opportunities to participate in cooking classes in Spain as they are readily available all around the country. 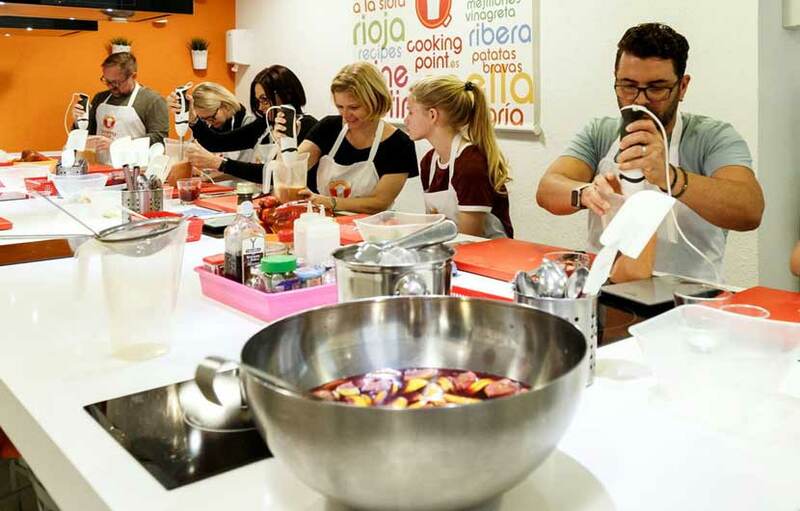 Cookery classes are a great way to learn how to cook Spain's most popular dishes whilst providing an interesting insight in Spanish culture, plus you get you meet lots of like minded people in fun and relaxed surroundings. 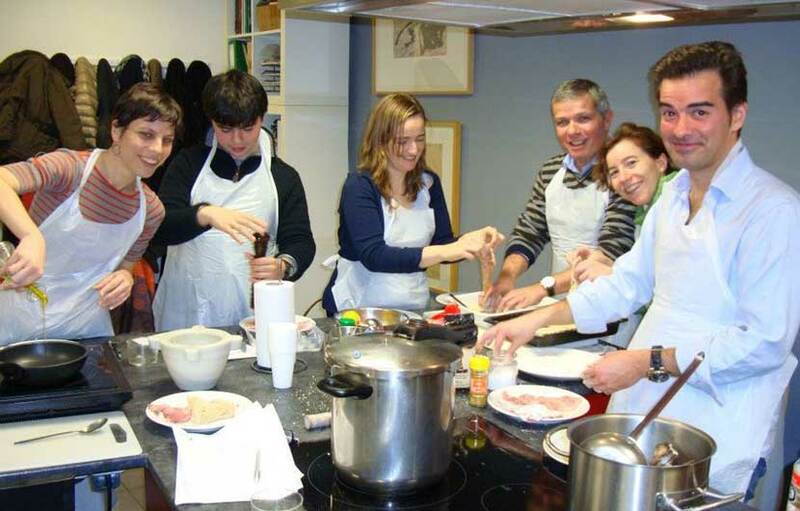 And if you fancy really immersing yourself into the Spanish way of life why not try one of a number of traditional Spanish cooking classes available throughout Spain. 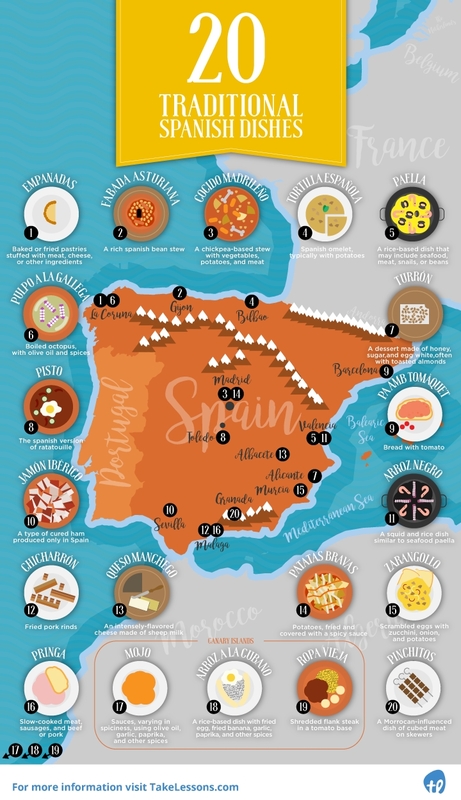 No matter where you plan to travel, check out this mouth-watering map that shows some of the traditional Spanish cuisine across the country. From the delicious paella in Valencia to the savory empanadas in La Coruña, you’ll get a little taste of all that Spain has to offer! 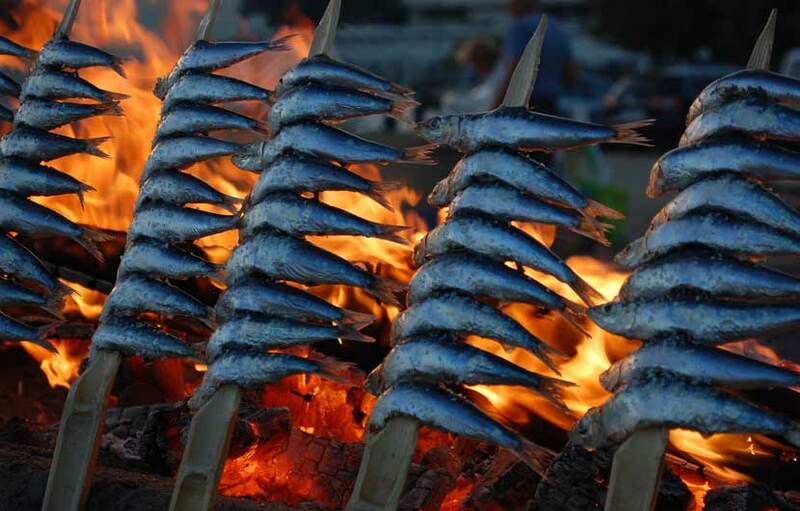 A walk along many of the beach promenades in Andalucia you are greeted by the unmistakable smell of Sardines being cooked over open fires. 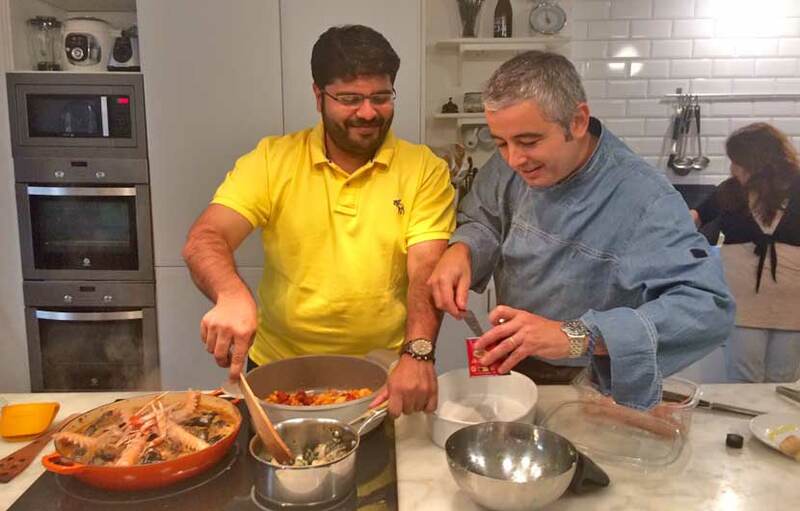 It may seem pretty straight forward to achieve the best results when cooking, however there are few things you should know to get ensure the Sardines are cooked to perfection. The spits are made out of a piece of bamboo, a cut in half and shaped rather like a knife with a longer thinner pointed end, it is best to keep the bamboo spits in cold icy water before use. The Sardines ( other fresh fish such as Sea-Bass can be cooked in the same way ) should be laid out in trays a few hours before cooking with an ample amount of good quality sea salt sprinkled over them, this is not only for taste but will harden the sardines slightly which makes them easier to feed on the spits. It is very important that the spit is placed in such a way that the sardines do not fall off , the way to do this is to thread the spit in below the spine and through the fish you notice the knife in the fingertip and the slide it through the stomach the same side as the entrance of the spit. Place about five sardines on each spit. If you use this method to cook the larger fish then the spit can be run through the mouth to the back fin. Leave plenty of time from lighting the fire to cooking to allow the flames to die down, the carbon or wood is ready when it the fire takes on more of white colour and there are no flames. Cooking time will depend on the inclination and distance of the spits to the fire, sardines usually take around 3-5 minutes on both sides and 7-10 minutes for larger pieces. Once cooked, sit back an enjoy with a nice glass of sangria, white wine or an ice cool beer. Here is a selection of recipes from some of our favourite food bloggers.